This is the cheapest I have found this for a very long time, its on clearance at Wickes shows as in stock. Also 2% Cashback with Quidco, and free click & collect. 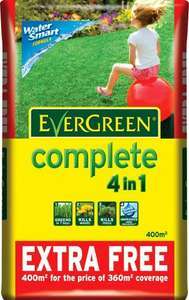 EverGreen Complete 4 in 1 will help you produce a more beautiful lawn after just one simple application. It’s unique 4-in-1 formula feeds and greens the grass, kills weeds and moss plus it helps your lawn make the most of every drop of water that falls. It’s quick and easy to apply through the built-in hand-held spreader. Just walk up and down the lawn to spread the granules in an even pattern. It will help your lawn to become thicker and greener so that it will trap rain and prevent water loss. The unique Water Smart™ formula of EverGreen Complete 4 in 1 builds strong roots to help protect your lawn against heat, drought and other stresses. I have used this every other month for a long time and my law always looks lush and green. Thanks for posting. I’ve added the price and merchant to the title. Here’s a ‘Help’ link which gives tips and advice on thread posting. Is it worth putting on now or best to save til Spring ?? I would suggest waiting until Spring - it does encourage a lot of top growth that can get caught by frost this time of year and if it's not cold enough for frost it will keep growing and you will need to keep cutting a wet lawn. Use an Autumn feed now to encourage root growth. Is it best to put Autumn feed on a day before it rains ? It does it need watering in ? Thankyou for your help is evergreen 2 in 1 best Autumn feed ?? is this the best stuff to thicken my lawn up? No, overseeding is the best thing for that - this will make what there is grow more, so it may appear to be thicker and more lush, but it's usually only the same old grass. Overseeding will introduce new grass to the lawn. Is it best to put Autumn feed on a day before it rains ? It does it need … Is it best to put Autumn feed on a day before it rains ? It does it need watering in ? Thankyou for your help is evergreen 2 in 1 best Autumn feed ?? I've always found there is enough natural water around (dew, fog, mist or rain) for the Autumn feed, so have never watered in. They generally don't contain as many damaging chemicals as the Spring/Summer feeds, i.e. no weedkiller and little nitrogen which can burn grass if not watered in. Look out for feeds with low N and higher P & K, maybe with added Iron for colour and to help control moss. Personally I have used Autumn feeds (in the soft South) until mid December, don't apply in frost, I usually wait until Amazon or Garden Centres have reduced price. I also use it as an early Spring feed - around mid March to pep up the lawn after the rigours of winter and before you really want the lawn to start growing. I've always found there is enough natural water around (dew, fog, mist or … I've always found there is enough natural water around (dew, fog, mist or rain) for the Autumn feed, so have never watered in. They generally don't contain as many damaging chemicals as the Spring/Summer feeds, i.e. no weedkiller and little nitrogen which can burn grass if not watered in. Look out for feeds with low N and higher P & K, maybe with added Iron for colour and to help control moss. Personally I have used Autumn feeds (in the soft South) until mid December, don't apply in frost, I usually wait until Amazon or Garden Centres have reduced price. I also use it as an early Spring feed - around mid March to pep up the lawn after the rigours of winter and before you really want the lawn to start growing. No, overseeding is the best thing for that - this will make what there is … No, overseeding is the best thing for that - this will make what there is grow more, so it may appear to be thicker and more lush, but it's usually only the same old grass. Overseeding will introduce new grass to the lawn. you seem to know your stuff so could i ask....if i do over seed, i presume i just chuck the seed on and leave it as it wont be possible to rake over....also do you know the deals on seed? also,i have a dog and his pee is causiing dead circles of grass, any tips for that? many thanks! Thanks for posting. I’ve added the price and merchant to the title.Here’s … Thanks for posting. I’ve added the price and merchant to the title.Here’s a ‘Help’ link which gives tips and advice on thread posting. I've never used it at this time of year however always worth a punt at this price for spring. hi slamb...quick bumpformy post 2up! Deal posting newbie! This is XXXSingh first deal post. Help out by leaving a posting tip or just to show your appreciation for their contribution.